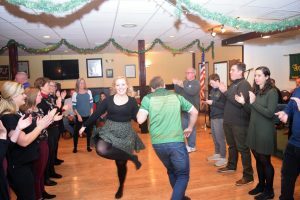 Members of AOH Division 3 in Pearl River, NY get the continued the joy of Christmas and Irish Tradition alive with their annual Wren Night celebration. The Fest of St. Stephen on December 26th was traditionally a day of festivities where young boys would collect money to bury a Wren. The wren had a chequered history in Irish folklore as a devious bird. According to legend in a competition to determine who was the king of the birds by who could fly the highest, it hid on the back of an eagle; when the eagle tired it jumped off to continue higher and earn the crown. In other legends, it betrayed St. Stephen who was hiding from his persecutors and Irish soldiers hiding from the English. In [re-CHristian mythology the Wren represented the old year, the Robing the new. After collecting the money, the wren would be buried and the money used to host a party for friends and neighbors. While no birds were harmed, Division 3 kept up the tradition of hospitality in a well attended evening of traditional song, recitation, and dance. The proceeds of the evening were donated to the Lourdes Kids of Rockland, a charity that sponsors young people facing serious challenges, many whom have never been able to travel beyond the confines of their home, on a pilgrimage to Lourdes, France.